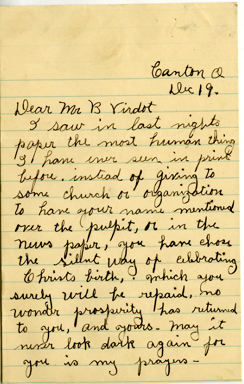 Ted Gup's 80 year-old mother handed him a suitcase filled with letters dated the same week in December 1933, all addressed to someone named Mr. B. Virdot. The mysterious benefcator replied to the letters with checks. It started with a suitcase . . . Ted Gup's 80 year-old mother handed it to him in 2008. "And then inside this were stuffed a couple of hundred letters," Gup said. "They were all from the same week in December of 1933. They were all addressed to someone named Mr. B. Virdot." The letters were a portal into the Great Depression and its impact on Individual lives and on the life of a community - Canton, Ohio, Gup's home town . . .
"I am 14 years old, and I'm writing this because I need clothing. And sometimes we run out of food . . . "
"Christmas will not mean much to our family this year, as my business, bank, real estate, insurance policies are all swept away . . . "
"When our rent, gas, coal and just the cheapest of food is bought. We have nothing left . . . "
So they will be able to spend a merry and joyful Christmas. The writer pledges that their identity will never be revealed. Please write B. Virdot. General Delivery, Canton, Ohio." At first Ted Gup had no idea who "B. Virdot" could be . . .
And then, he told Braver, all of a sudden, "the light went on." The mysterious B. Virdot was an invention of his grandfather, "an amalgam of his three daughters' names: Barbara, Virginia and Dorothy." Ted's mom, Virginia Stone, says she does not remember her parents being involved as the benefactor, and had never heard of "B. Virdot" before: "No, no, I do not think so." "Any stray person who had a real problem, a down-and-out person, yes, my father was interested in," she said. "Your dad was Jewish, but he wanted to give kind of a Christmas gift," said Braver. "Why do you think that was?" Braver asked. "Dad loved Christmas; it was his favorite holiday," Stone said. For Ted Gup, the story was just beginning . . .
An author and investigative reporter, he started researching the dark years of Depression-era Canton, where unemployment was estimated to have been about 50 percent. "This is a town where they made things that were hard and tough . . . roller bearings, vacuum sweepers, steel bricks," Gup said. "And people were being laid off left and right." "Are there any parallels between what was going on then and what's going on now, with this recession that we're in?" Braver asked. "There are parallels," he replied. "There are a lot of people hurting in the community, but it's a different America. There's more of a safety net. In 1933, there was nothing to catch these people if they fell. They just descended. And they could watch themselves and their children starve." "You can see they are all on the George D. Harder bank for $5.00," Gup said, showing Braver the checks. It doesn't sound like much, but it would be the buying power of $80 to $100 today." "It wasn't going to reverse the momentum of the Great Depression. But it could reverse the feeling of isolation and abandonment for these families," Gup said. And so Ted Gup started tracking down the descendants of those Families, their stories documented in his new book, "A Secret Gift." Ken Richards was not yet born when his mother Mattie wrote saying that the 37 cents an hour her husband earned part-time, "does not mean a thing in the way of Christmas." "When you were contacted by Ted and he read you this letter, what went through your mind?" Braver asked. "Total disbelief," Richards said. "My mother was never one to ask for help, for any reason whatsoever." "I rode that tricycle, my legs hanging over the handlebars, at 12 years old," she laughed. Delores Keough's grandmother, Ida Bailey, wrote that, "We don't have bedding enough, to keep us warm." "I was really dumbfounded," Keough said. "I just never thought anything like that happened back during the Depression." Only one of the original letter writers is still alive. Helen Palm, now hitting 91, was 14 when she wrote . . .
"My father does not want to ask for charity, but us children would like to have some clothing for Christmas. Palm still remembers the patent letter shoes she bought, and she had a chance to talk about it all with families of other writers last month, at a gathering at the old Palace Theatre in Canton. "It is a night to remember our parents and our grandparents, those who went before us, and who sacrificed a great deal that perhaps we might have a better life," Gup said. And Ted Gup also told the audience he now knows that the man who gave the secret gift had a secret of his own. "I now believe that he intentionally reached out to the wider and gentile community for accepting him, when other countries did not, and providing him a home," Gup said. "I'd put my arms around him, and I'd just kiss him, " said Helen Palm, "and thank him for being so kind."